WDR49 contains 8 WD repeats. The exact function of WDR49 remains unknown. There are two named isoforms. 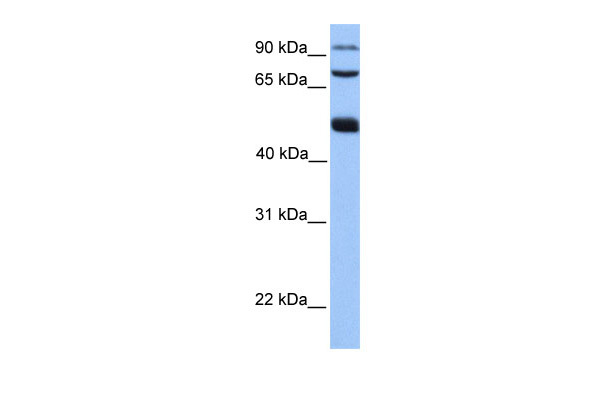 WDR49 antibody (C-term) (AP54547PU-N) immunohistochemistry analysis in formalin fixed and paraffin embedded human skeletal muscle followed by peroxidase conjugation of the secondary antibody and DAB staining. 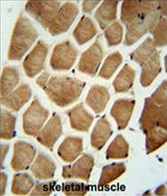 This data demonstrates the use of the WDR49 antibody (C-term) for immunohistochemistry. Clinical relevance has not been evaluated. 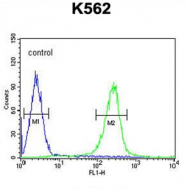 WDR49 Antibody (C-term) (AP54547PU-N) western blot analysis in K562 cell line lysates (35 µg/lane). This demonstrates the WDR49 antibody detected the WDR49 protein (arrow). 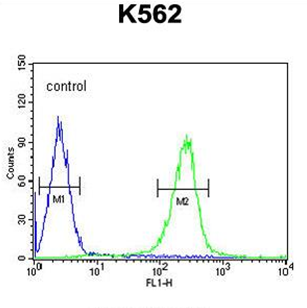 WDR49 Antibody (C-term) (AP54547PU-N) flow cytometric analysis of K562 cells (right histogram) compared to a negative control cell (left histogram). FITC-conjugated goat-anti-rabbit secondary antibodies were used for the analysis.